Fake Flash Repair How to repair Fake USB flash disk with MyDiskFix ? How to repair Fake USB flash disk with MyDiskFix ? MyDiskFix is a free software that can help users to restore the real size of fake Chinese USB flash disks or SD memory cards.When you buy a fake USB flash disk from the internet from unknown sellers especially Chinese sellers and you found that you bought a 64 GB but the actual capacity of the flash drive is 8GB only !!. Don't worry because MyDiskFix low level format tool can determine the actual size of the fake pen drive .MyDiskFix can scan and repair the corrupted fake USB drive or memory card . 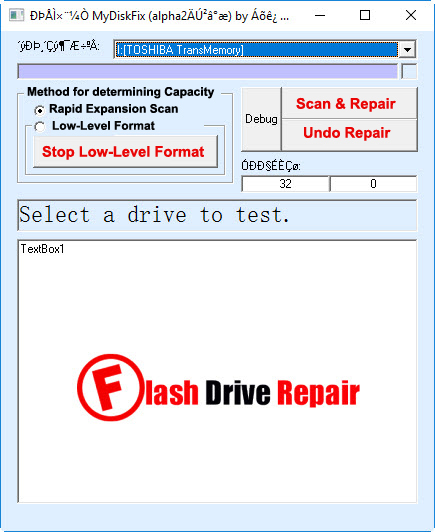 To start fix the fake USB flash disk , you need first to download h2testw software to determine and detect the actual capacity of the fake USB .You can download h2testw v1.4 from this article " How to use h2testw for testing fake usb flash drives ? " then follow the instructions below . Many users have success with mydiskfix tool and they fix their fake USB flash drives .Here we will show some of MyDiskFix succeeded repairing with some kind of fake flash drives and memory cards . Please note that I'm not guarantee that MyDiskFix will fix your flash drive but you must try it because it succeeded with some and failed with others . 1- MyDiskFix succeeded to repair fake USB flash disk with VID 1221 , PID 3234 and VID 0011 , PID 7788 . 2- MyDiskFix succeeded to fix a 32 GB Samsung fake usb flash disk and converted it to it's original size 2GB with VID 058f , PID 6366 . 3- MyDiskFix succeeded to fix a 64 GB Fake Micro SD card with chip controller Alcor AU6362 - AU6375 with VID 058F , PID 6362 and the result is 8GB . 4-MyDiskFix succeeded to Format fake 64GB Samsung Micro SD-HD bought from chinese seller on ALiexpress website , the result was 30GB . 5-MyDiskFix succeeded to reformat fake USB Pen drive 64GB with VID ABCD , PID 1234 and Chip controller was Chipsbank with chip model CBMeneral "CBM2098E Series Chip " the result was 32GB . 6- MyDiskFix succeeded to reformat fake USB flash disk 64GB with VID 1111, PID 2222 , chip controller Micov and Chip model MW8209 / MW8219 / MXT8208, Toshiba .The result was 8 GB . 7- MyDiskFix succeeded to repair fake Chinese Anson Micro SD card 32 GB , the result was only 8GB . How to fix Fake USB flash disk with MyDiskFix ? First you need to download this software first "h2testw v1.4" from this article " How to use h2testw v1.4" . Test and determine the actual capacity of your flash with h2testw then download MyDiskFix from the links below . Run MyDiskFix As Administrator . The software interface will not appear in proper way especially the software commands so i make translation to the commands on English so please look to the previous picture . 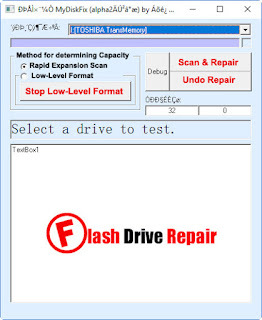 To start repairing your fake USB flash disk , please click on Scan & Repair . Please if this software succeeded with your flash disk , leave a comment with the information of the fake flash drive . It worked for me. Fixed a 2 TB fake chinese stick that was actually a 16 GB.